War is Hell, my friends. Once again, my sovereign territory has been invaded. While leaving the house recently to procure some chow, my attention was called to yet another wasp nest being constructed on my property. 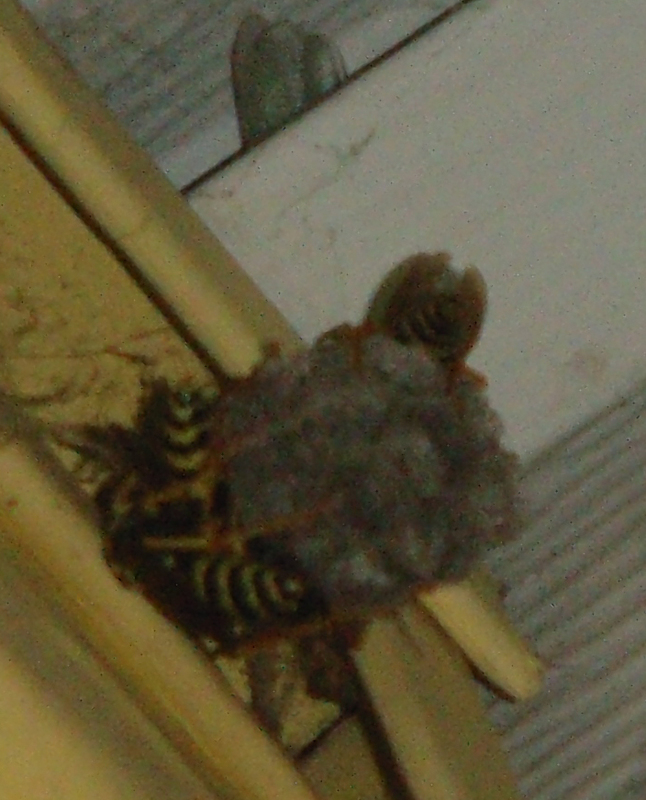 I dispatched them by spraying some generic insect killing spray onto the nest which quickly killed the five wasps that were building the nest. I can no longer tolerate these pests trying to establish a beach head on my territory. Something has to be done, and, since I still am not willing to choke on my pride and call in a professional exterminator, I am considering a number of precautions to keep these winged mini-demons from returning for a sixth attempt. Thanks to the wonder of Google and the Internet, I have found a number of exotic solutions that I think may help in my continuing battle. Have a look at some of the suggestions below. Some of them, I have already implemented, some of them, I might get to should another invasion take place. I got my trash bin fixed so that the lid will not pop open any more, thus eliminating a large food source for the wasps. I'm going to eliminate standing water as a drinking source by making sure the pool is chlorinated and shocked weekly. Supposedly, you can place a penny in a plastic sandwich bag and fill the bag with water. Then, use some clothespins to attach the bag to a clothes hanger and hang it around your porches, doors, windows and patios. Any insect with compound eyes (such as bees and wasps) will be tricked into thinking that the bag is a spider's web, and the penny will look like a spider sitting in the web. There is a product called the Waspinator which mimics a wasp nest. Hangingone or several around the outside of the house will indicate to other wasps that the area is already taken and they will supposedly stay away. It is sold at most garden centers. Remember, that if you do find a wasp nest and intend to get rid of it yourself, make sure to do so at dusk or at dawn when wasps are the least active. Good luck to you all, and let's be careful out there.